I accepted an offer to review Mary Jean products. They were very generous and sent several samples. Mary Jean Ltd is a family owned business from the Highlands of Scotland. Products are handmade without chemical fillers and the range includes soaps, lip balms, body butters, bath bombs, bath salts, candles and creams. I received samples of Organic Zinc Free Baby cream, Vitamin Rich cream, Organic Tea Tree Body Butter, Organic Lavender Body Butter and Natural Strawberry lip balm. I shall give a mini review for each product. Organic Zinc Free Baby Cream £7.50 for 50g - I do not have any small people in my life so can not comment how the baby cream would be on a baby's bottom. I have tested it on my own skin. The cream is light and creamy with a fresh scent. It does not leave behind a greasy residue. Vitamin Rich Cream £12.50 for 50g - At first the bright orange colour takes you by surprise. I asked my sister to review this product for me as I was in the middle of trialling another face cream. My sister felt it was too rich for her skin but her boyfriend ended up pinching it from her. He says he likes the cream and the way it softens his skin. From what he is telling me, I am assuming a dry and mature skin type would enjoy this product. Organic Tea Tree & Peppermint Body Butter £6.49 for 100g - This butter is recommended for dry and mature skin. It contains shea butter and Macadamia nut oil. This is a solid butter which you need to scoop out of the packaging but it does melt easily into your skin. As with most body butters you need to allow time for your skin to absorb the product. The fragrance is fresh but not something I would gravitate towards. I imagine problematic skins would benefit from the tea tree oil in this product. Organic Lavender Body Butter £6.49 for 100g - This butter is recommended for dry and damaged skin (Lavender helps regenerate damaged skin). I am a big fan of lavender, I find it a relaxing fragrance so I have enjoyed using this product. Once again the base ingredients are Shea butter and Macadamia nut and the consistency is the same as the Tea Tree version. 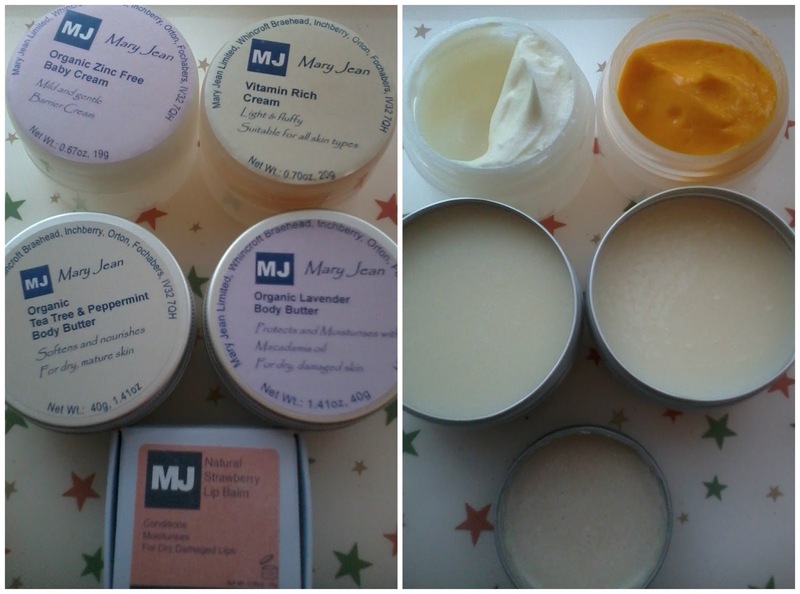 Other body butters available include Original and Chamomile & Geranium. Natural Strawberry Lip Balm £2.99 for 10ml - a very gentle delicate fragrance of strawberry. The balm is solid but melts on contact with warm skin. It is not heavy or sticky and leaves my lips feeling soft and smooth. The lip balm is also available in Banana and Vanilla & Cocoa. Overall, I have enjoyed using these products and I am happy to recommend them to you. These are good quality handmade products at affordable prices. Disclaimer - I was sent these products to review, all opinions are my own, I am not being paid to review these products or promote the websites, links are not affiliated. I want to try the lip balm now!